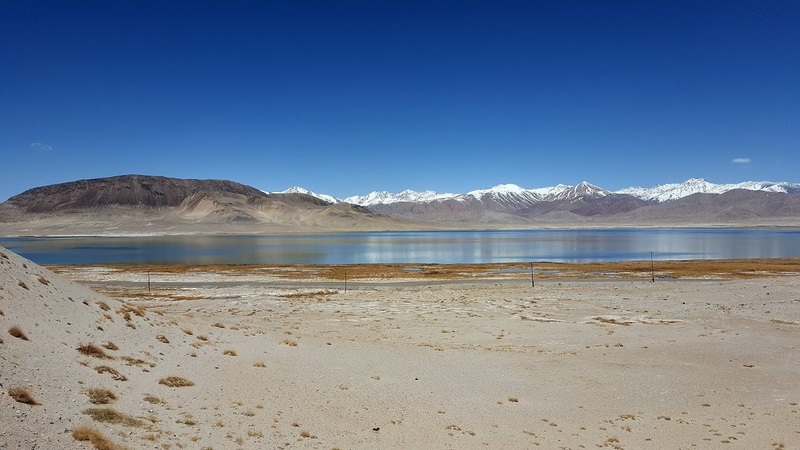 Karakul lake spread its waters in Markansu valley – one of the most driest place in Central Asia. Surrounded by high mountains which block humid air masses the valley has less than 30 mm of precipitation a year which is 3 times less than in Karakoram desert. Fluctuation of temperatures is a usual thing for desserts and in Karakul lake they are just incredible. The great Russian Explorer of Pamirs N. Korjenevskiy, describing lake Karakul wrote: “In Febrary, at 9am the temperature was -35 Centigrade, while at 1 pm the temperature raised up to -6,2 Centigrade and so fluctuation of temperature for 4 hours was 28.8 Centigrade”. The temperature measurement taken between 1933 and 1934 shows there were only 15 frost-free days a year and by latest measurements taken in our days it is known that 67 of 100 years had no frost free periods at all. Karakul is kyrgyz for “black lake” and its indeed looks black when the sun is hidden by clouds. Karakul has an area of 380 sq km and lies at the altitude of 3914 metres above sea level. It’s the most highest lake in the world excluding those in Tibet and even Titicaca lake – the biggest alpine lake in the world is located on lower altitudes. The lake has 2 basins separated by a peninsula from the south and an island in the north. The island is 8 km long and 4 km wide. The strait between them is 1 km wide. East side is 22,5 metres deep, while west basin deepest point is 236 m. There are 3 rivers flow in but these days the lake has no outflow and therefore the water is very salty. The salt mineralization is constantly increases and 1 liter of boiled out water would leave 7 grams of salt which makes the water undrinkable and useless for watering. Sulphate salt makes water taste brackish. Karakul’s water level is now much lower than before, but this fact also applies to many other closed lakes of Inner Asia. N. Korjenevskiy noted that before Karakul lake was at least 60 metres above the present level. But even 37 metres is enough to create an outflow on the south where the valley ends up with flat pass towards Kokuibel valley. This means the lake was much bigger in the past and had an outflow that feed Pyanj and finally Amudaria River known in the west as Oxus. Its not exactly known when the lake had an outflow, should be an ice age, when glaciers were on much lower altitudes and some of them flow down the lake. Later the lake’s territory reduced, the depths diminished, the lake lost its outflow and finally became salty. The Karakul lake impact structure remained unidentified until the recent geological research undertaken by Russian scientists along with studies of imagery taken from space which let some scholars to diagnose Karakul Lake depression as meteorite impact crater with a rim diameter of 52 kilometers and created some 230-190 mln years ago.